Jusoso Tadakiyo (1875-1941) Ichikawa Danjuro IX as Soga Goro Takimune in the play Yanone, 1896. Oban. The series of eighteen plays known collectively as Kabuki Juhachiban, were co-opted as a whole by the Danjuro lineage of actors in 1832. The eighteen plays, some of them parts of plays, others dances, were designed to show of the Danjuro style of acting in its most favorable light. The tradition continued and subsequent generations of Danjuro’s kept the complete repertoire and made it their own. This astonishing print from the 1896 series commemorating the Kabuki Juhachiban is widely acknowledged to represent Meiji printmaking at its very best. Not only do the designs - which are all exceptional and dramatic - stand out, but the technical achievement has perhaps never been bettered. The series is a father and son collaboration between Kiyosada and his son who confusingly for us used several names throughout his career including that of his father. 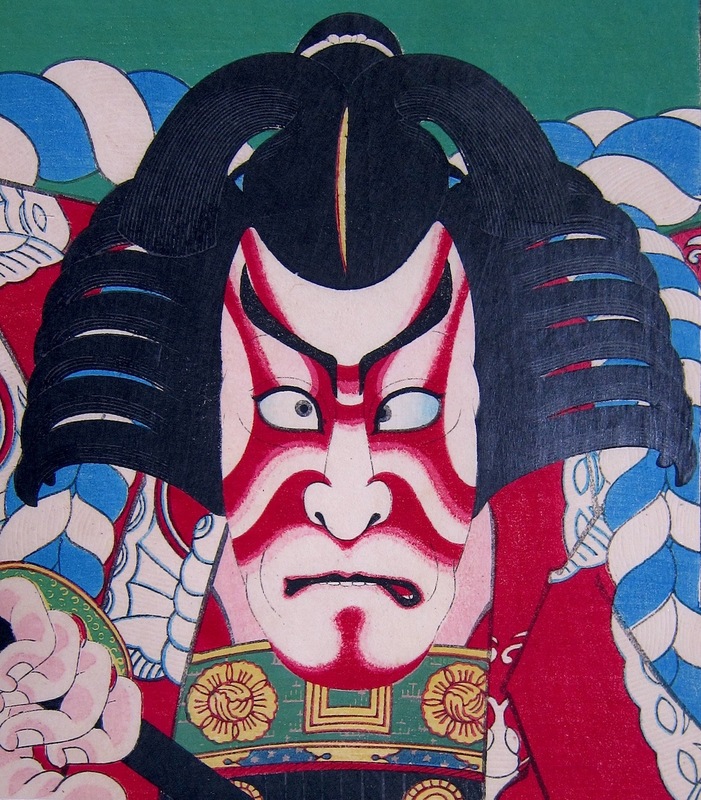 He was an intimate of the last giant of the kabuki stage, Ichikawa Danjuro IX hence this exceptional series of prints. 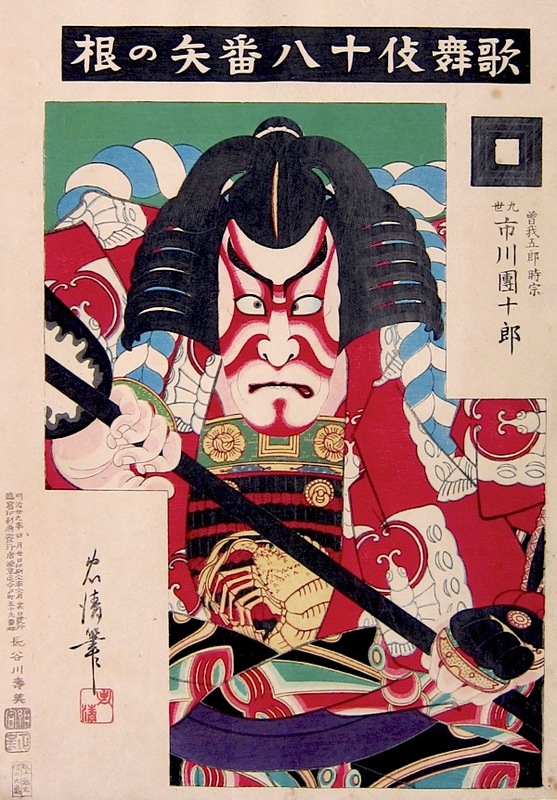 This brilliant piece, (one of the great images of ukiyo-e) represents Danjuro in the short drama Ta No Ne. The play is from the vast repertoire of Soga Brothers plays popularly performed in the New Year. Soga Goro is at home at the New Year, polishing arrow heads for his planned revenge against his father's enemy Suketsune. Tired from his work, he takes a nap, placing a picture of the treasure ship of the Seven Gods of Good Fortune, said to bring a fortunate first dream, below his pillow. But Goro dreams that his brother Juro has been captured in the Suketsune house and is crying for help. He leaps up from the dream, and grabbing a horse used by a radish seller, rides off to help Juro. Superb print with extensive and complex embossing and other refinements. Very fine printing, edition, color and condition.